1921 - National Child Welfare Association Inc., NYC - This handsome piece came from Yvonne Woodward, sister of the late black activist Malcolm X. Joseph Charles Price, (1854--1893) founder and first president of Livingston College, in North Carolina, was born free on February 10, 1854 in Elizabeth City, North Carolina. In 1890 he became involved in the Afro-American League and was elected president of the National Protective Association. That same year he was voted one of the "Ten Greatest Negroes Who Ever Lived." 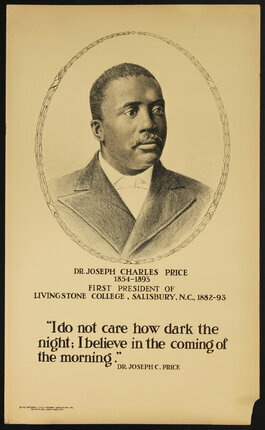 Price advocated education to help ameliorate the damages done by generations of slavery and discrimination for whites as well as blacks. He died in Salisbury, North Carolina in 1893.